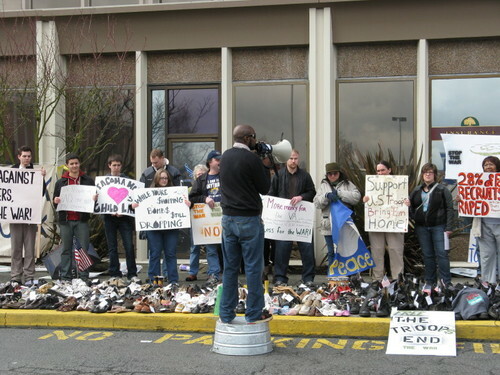 Good News....the pro-military supporters at Tacoma Mall today outnumbered the "Shut the Mall" protestors three to one! Protestors never got to the front of the military recruiting station and had to do their protest speeches on a side street. Military supporters had lots of "support the troops" signs and lots of American flags. Chants like "Where are Your Flags" and "Don't Dishonor Their Names" greeted protestor attempts to read the names of the war dead. The protestors didn't have one American flag beyond an old 13 star flag....which they had to go find. By about 2:45 pm the protestors gave up and left the area. Tacoma Police were out in numbers and did an outstanding job of making sure no incidents took place. 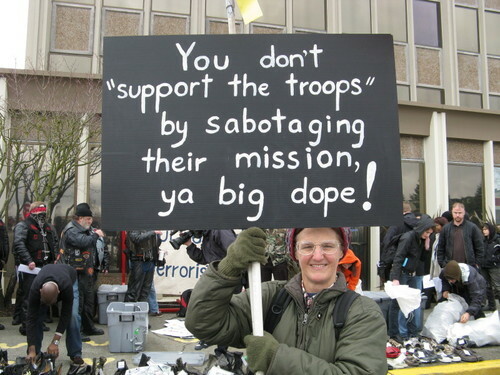 Additionally, lots of 28th District folks turned out to show their support for the troops and several were interviewed by Seattle TV crews.....so watch tonight's news. Same for Shelley Weber who helped organize the turnout! KING TV has the latest on the military protests planned in Tacoma. (I Corps Force Protection Memo) - Recommend that DOD affiliated personnel, family members, retirees and civilians avoid the Tacoma Mall area on 15 March 2008 from 1200 to 1730 hours. Anticipated activities include distributing ant war and anti military literature, confront local recruiters or persons trying to enter their facilities, and attempts to interact with soldiers, family members and/or civilians who appear to be military or have DOD decals on their vehicles. Recent protests against the war at the Port of Olympia have been marked by increased levels of violence. DOD personnel, family members and civilians should avoid contact, to include conversations or dialogue with protesters. Protesters may be filming activities for reporting in independent media or use in legal actions. Commanders and supervisors should strongly encourage their soldiers, family members, and civilians to avoid the Tacoma Mall area during this time and to report incidents of violence to local police. For non-critical information, contact Washington State Police at (253) 536-6210 or Tacoma Police Department at (253) 594-7800. 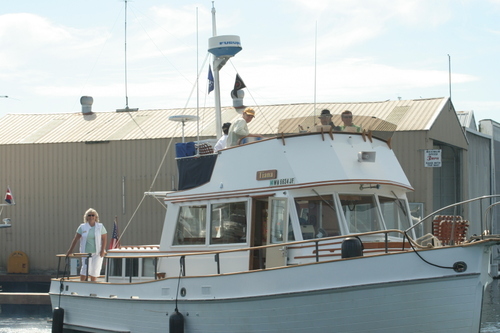 The Tacoma Pierce County Chamber of Commerce and Harborstone Credit Union sponsored the annual Evergreen Fleet Cruise, a chance for local businesses to show their support o fthe military by inviting key military leaders for a day on the Sound. Here are photos from the day courtesy of the Chamber. 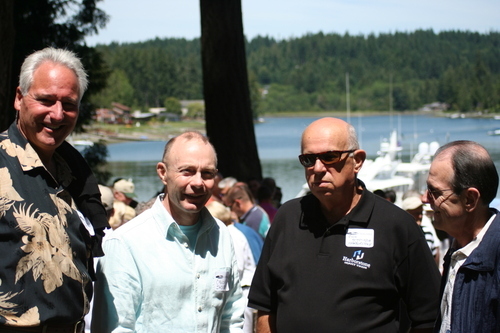 Pictured: (l-r) David Senner, Chamber president, Lt. Gen. Charles Jacoby, commander, I Corps and Fort Lewis, Rick Schmidtke, CEO of Harborstone Credit Union and David Graybill, Chamber CEO. (Metro Parks Release) – For floral fireworks all month long, visit the red, white, and blue spread of browallias, petunias, and salvias at the W. W. Seymour Conservatory in Wright Park, 316 South G Street. Tuberous begonias, celosias, and sunflowers will make appearances as well. Every month the Conservatory features a new plant display just right for the season. From exotic tropical plants to front yard favorites, the displays make for a great stop on your walk through Wright Park. At 1:00 p.m. on July 8 enjoy music featuring King Street Quintet as part of the Second Sunday music series. Performances are a regular feature on the second Sunday of the month. The W.W. Seymour Botanical Conservatory is located at 316 South G Street in Tacoma’s Wright Park. Operating hours are Tuesday through Sunday from 10 a.m. to 4:30 p.m. The Conservatory is closed on Mondays, Thanksgiving, and Christmas. There is no admission charge but donations are appreciated. 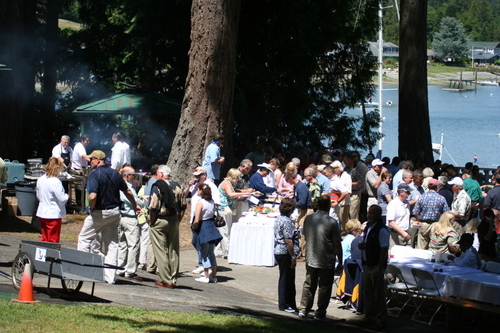 For more information, call 253-591-5330 or visit www.metroparkstacoma.org. 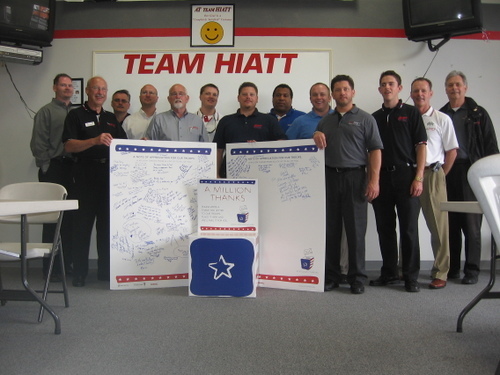 Hiatt Pontiac, Suzuki and GMC in Tacoma members pose with the appreciation boards they collected from customers and staff for local military members. Included were a box of letters collected to send to service men and women, Hiatt collected 179 letters in all as well as all the notes on the appreciation boards. They will be sending in the letters to be distributed by A million Thanks. They will be contacting the local VFW to take the appreciation boards to them. The Seattle Times has a feature on Congressman Adam Smith (D-WA), the man who represents the South Sound and Fort Lewis. In tomorrow's issue of the Fort Lewis Ranger, our reporter Jessica Corey-Butler reports from the Tacoma Sheraton where a DoD Task Force was wrapping up study sessions on the mental health of soldiers on the battlefield. The following is the first part of her story. 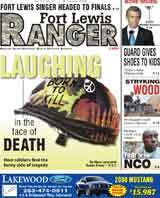 Pick up the Ranger on stands tomorrow for the rest. He told of “taking down” sometimes 300 buildings in a day. He continued about “the bad shoots,” where there would be women and children killed in the course of securing a volatile room. The Task Force which heard Adam’s testimony, as well as that of others Monday and Tuesday, and which listened to informational briefings on various mental health related topics, was comprised of Department of Defense and non-Department of Defense professionals with relevant expertise in the field of Mental Health. (Tacoma, WA) – Tacoma Art Museum’s Art Access Pass partnership with Tacoma Public Library and Pierce County Library System has expanded to include the Fort Lewis Library System and McChord Air Force Base Library starting January 5, 2007. The program allows library patrons to use their library cards to borrow the Art Access Pass, just like a book, video, or CD, to receive up to four free admissions to Tacoma Art Museum. Anyone with a valid library card at one of the four participating library systems can check out the Art Access Passfor up to seven days. After a week, the cards are charged an overdue fee by the library. The Pass allows up to four free museum admissions, not including children under age six, who are always admitted free. Tacoma Art Museum also hosts Art Access Pass art-making activities at participating library branches throughout the year. These free programs feature projects for children age six and older that relate to the exhibitions on view at the museum. A full schedule of programs is available at www.TacomaArtMuseum.org or through the local library branch. The Fort Lewis Library System is comprised of four libraries that support the Army mission, offer on-post college courses, and encourage lifelong learning opportunities. The 43,000 active-duty soldiers, family members, retired military, and civilian employees at Fort Lewis and Madigan Army Medical Center have library cards. They checked out 259,000 items in 2005 and made 356,000 visits to the libraries during that time. The McChord Air Force Base Library provides access to information which supports the Air Force mission, education, and quality of life programs on base. The 8,000 active-duty airmen, family members, retired military, and civilian employees at McChord have library access. In 2005, they checked out 113,000 items and made 58,000 visits to the library. Tacoma Art Museum’s mission is to connect people through art. The museum serves the diverse communities of the region through its collection, exhibitions, and learning programs, emphasizing art and artists from the Northwest. The museum’s five galleries display an array of top national shows, the best of Northwest art, creatively themed exhibitions, and historical retrospectives. In addition, there is an Education Wing for children, adults, and seniors with an art resource center, classroom, and studio for art making. Tacoma Art Museum is located near the Museum of Glass, the Washington StateHistory Museum, and historic Union Station.